*AdvaCare Metronidazole Infusions are GMP certified. **AdvaCare Metronidazole Infusions are manufactured in our facilities located in China, India and USA. AdvaCare is a GMP manufacturer of Metronidazole infusions. Metronidazole infusion is used in treatment of serious infections caused by anaerobic bacteria or protozoa when oral administration is inappropriate. The intravenous preparation can also be used when oral administration is possible but immediate anti-microbial action is required. 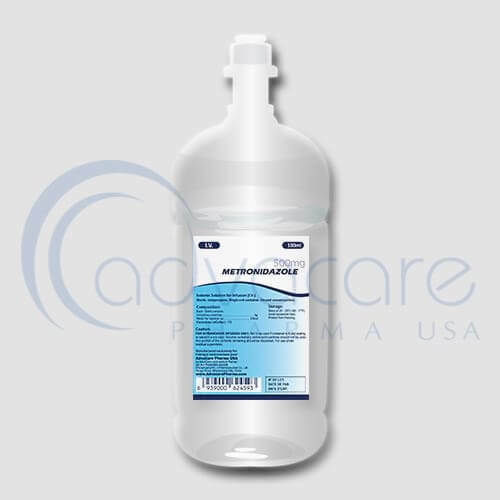 Intravenous metronidazole can also be used during surgery (eg: appendicectomy, colonic surgery, vaginal hysterectomy) for prevention of wound contamination with anaerobic organisms. Treatment should be initiated only by physicians who are experienced in the treatment. As with all pharmaceuticals some unwanted effects can occur from the use of metronidazole infusions. Always consult a doctor or health care professional for medical advice before use. Common side effects include: rash, nausea, loss of appetite, furry tongue, dry mouth, abdominal discomfort, inflammation of tongue and oral cavity. Always consult your doctor or pharmacist before taking metronidazole infusions. You have history of blood dyscrasias. Over dosage, application frequency, and treatment duration of metronidazole infusions should not be exceeded. Consult with your doctor about any medications you are taking, before your treatment with metronidazole infusions.